The US still hasn’t managed to pass legislation requiring verification of a company’s true owners as a condition of incorporation, which would be the most comprehensive solution to the anonymous company problem. Nor has the US taken the logical step of extending KYC laws to real estate agents across the board. But starting back in 2016, the US Treasury Department’s Financial Crimes Enforcement Network (known as FinCEN) took an important step toward cracking down on anonymous purchases of luxury real estate by issuing so-called Geographic Targeting Orders (GTOs). And thanks to some excellent research by the economists C. Sean Hundtofte and Ville Rantala (still unpublished but available in working paper form), we have strong evidence that many purchasers in the luxury real estate market have a strong interest in concealing their true identities, and that requiring verification of a company’s ultimate beneficial owners has a stunningly large negative effect on the frequency and aggregate magnitude of anonymous cash purchases. Before proceeding to Hundtofte & Rentala’s main findings, some quick background on FinCEN’s GTOs. In a nutshell, these GTOs require that, for covered real estate transactions, the title insurance company that provides coverage to the purchaser in an all-cash transaction by a company must verify the ultimate beneficial owner (defined as a person who owns, directly or indirectly, at least 25% of the equity in the company), and provide that information to the Treasury within 30 days after closing. (The regulation applies to the title insurance company, rather than the seller and/or buyer, because FinCEN has the legal authority to impose regulations on title insurance companies but not to the other parties to the transaction. It’s possible to purchase real estate without title insurance, which would allow the buyer to remain anonymous, but doing so is very risky.) Whether a transaction is covered by a GTO depends on the location of the property and the purchase price. The first GTOs, announced in January 2016 and implemented in March 2016, only covered two markets: Manhattan (for purchases over $3 million) and Miami-Dade County (for purchases over $1 million). In July 2016, FinCEN announced that it was expanding the program to cover a number of other major metropolitan areas—including Los Angeles, San Diego, San Antonio, San Francisco, Palm Beach, and the rest of New York City—with purchase price thresholds ranging from $500K to $2 million; these GTOs became effective in August 2016. In August 2017, FinCEN announced an additional GTO for Honolulu. And most recently, in November 2018, FinCEN further expanded the program with an additional set of GTOs to cover a number of other cities, including Boston, Chicago, Dallas, Las Vegas, and Seattle, and lowered the purchase price threshold for triggering the ownership verification requirement to $300,000 in all of the covered markets. Penalties for violating the GTOs are stiff, with fines up to $250K and five years in prison for willful violations. If it’s in fact true that a desire to maintain anonymity is a major reason for all-cash real estate purchases by companies, then the GTOs—if effective—should substantially reduce such purchases in covered markets. If, on the other hand, anonymity is merely incidental to, and not the main reason for, the bulk of these transactions, then the GTOs shouldn’t have much of an effect, since the ownership verification would be a minor formality in cases where there was some other good reason to structure the purchase as an all-cash purchase by a company. We would also see little effect on the proportion of all-cash company purchases if the GTOs were easy to evade. Hundtofte & Rentala set out to find out what impact the GTOs had, and the effects were dramatic and unambiguous: The introduction of the GTOs caused all-cash purchases by anonymous companies to dry up. They only have data covering 17 states (plus DC), and their data only goes up to the end of 2016 (meaning that they can’t measure the impact of the expansions of the GTOs in 2017 and 2018), but the data that they do have tells a clear story. They do all the requisite fancy statistical analysis (regression discontinuity analysis, as well as differences-in-differences analysis using counties not covered by the GTOs as controls), but really all a lay reader needs to see to understand the main punchline are the following two pictures. And here’s a second picture, limited to Miami-Dade County. (Apologies but for some reason the scale and axis labeling gets screwed up when I copy the figure—you can find the original on p. 27 of the working paper. 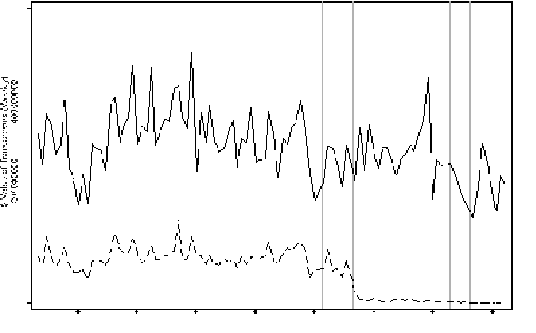 The time scale on the x-axis is the same, and the vertical gray lines again represent the dates for GTO announcement and implementation.) 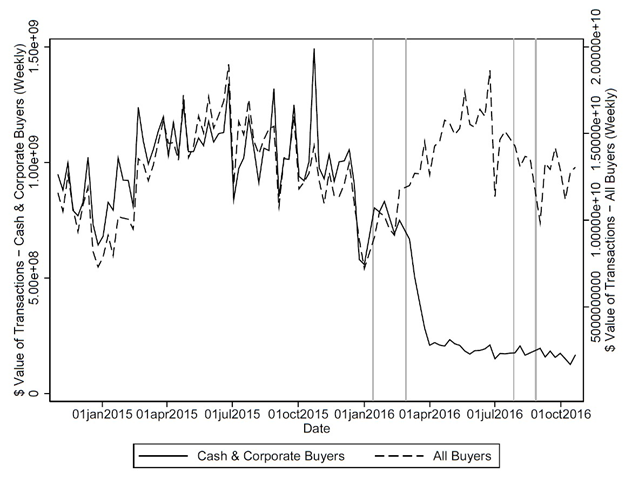 Here for some reason the authors have reversed the coding such that the dashed line represents cash purchases by companies and the solid line represents all other purchases, but the bottom-line result is basically the same: Cash purchases by companies were a significant part of the Miami real estate market before the Miami GTO went into effect in March 2016, and after that date such purchases dried up almost entirely. Those pictures tell most of the story. The more comprehensive statistical analysis fleshes this out a bit more. Among other things, the authors estimate that prior to the GTOs, cash purchases by anonymous companies made up roughly 10% of the dollar value in residential real estate purchases, and after the GTOs were introduced, all-cash purchases by companies dropped by roughly 70%. Interestingly, the announcement of the original GTOs for Manhattan and Miami appeared to have had a big effect in other markets, to which GTOs only extended later—perhaps, the authors speculate, because FinCEN made it clear that expansion was coming, or perhaps because the GTOs signaled more generally that the US government was going to be scrutinizing real estate purchases more closely. The study also found that, following the introduction of the GTOs, the overall price of luxury real estate in the covered markets declined by a substantial amount—around 4-5%–suggesting that a significant demand for anonymously-held luxury assets was driving up prices. What do we learn from this? A few things. First, and perhaps unsurprisingly, there’s a big market for secrecy. The anonymity that comes with companies rather than individuals purchasing high-end real estate is not merely incidental, but rather—in the large majority of cases—the main reason that the companies rather than the individuals are the formal purchasers. That does not by itself demonstrate that most of these purchases were to facilitate money laundering or other criminal activity, but it certainly suggests that we’re right to be worried that many purchasers are trying to hide their identities. Second, both the magnitude and speed of the GTOs’ impact demonstrates how relatively simple transparency reforms can have a big and immediate effect. This doesn’t mean that we’ve solved the problem—it’s quite possible, indeed likely, that bad actors will shift from luxury real estate purchases to one of the many other loopholes through which they can buy assets without having to reveal their identities to regulators, or perhaps to real estate purchases in other jurisdictions. But it does suggest that simply requiring the provision of beneficial ownership information in high-risk transactions can have a strong deterrent effect. And this in turn suggests that requiring the provision of beneficial ownership information at the moment of company formation—a reform that the US Congress will consider again this year—is an idea whose time has come. This entry was posted in Commentary and tagged AML, anonymous companies, beneficial ownership, C. Sean Hundtofte, FinCEN, Geographic Targeting Orders, know your customer, Manhattan, Miami, money laundering, new york city, New York Times, real estate, Time Warner Center, U.S. Treasury Department, United States, Ville Rantala by Matthew Stephenson. Bookmark the permalink. “[N]estled in the [stringent antimony laundering provisions contained in the 2001] PATRIOT Act lay the handiwork of another industry’s lobbyists. Every House district in the country has real estate, and lobbyists for that business had pleaded for relief from the PATRIOT Act’s monitoring of dubious foreign transactions. They all but conjured up images of suburban moms staking FOR SALE signs on lawns, ill-equipped to vet every buyer. And they persuaded Congress to grant the industry a temporary exemption from having to enforce the new law. “The exemption was a gaping loophole—and an extraordinary growth opportunity for high-end real estate. For all the new fastidiousness of the financial system, foreigners could still buy penthouse apartments or mansions anonymously and with ease, by hiding behind shell companies set up in states such as Delaware and Nevada. Those states, along with a few others, had turned the registration of shell companies into a hugely lucrative racket—and it was stunningly simple to arrange such a Potemkin front on behalf of a dictator, a drug dealer, or an oligarch. While GTOs seem very promising, I can’t help but wonder why Congress has declined to implement what the post acknowledges is a much simpler solution––a nationwide law requiring verification of a company’s owners. Does blame lie solely with lobbying efforts by the real estate industry, as argued by the Atlantic article Rick cites? Are there substantive arguments against such a law? None come to my mind, at first glance. My impression is that it really is mainly about lobbying by those industries and sectors that profit from buying and selling corporate anonymity–not just real estate, but also the American Bar Association. Other opponents of a nationwide company ownership database include the Chamber of Commerce and the Koch brothers’ network. The previous version of the bill that would have created such a database also included a more controversial provision on applying suspicious transaction reporting requirements to “gatekeepers,” including corporate registration agents. This provision was more controversial and attracted concern not just from the ABA but also from privacy advocates like the ACLU. For reasons I explain in a couple of the above posts, I don’t think this provision was actually all that problematic given how it was drafted, but in any event it’s quite different from the ownership verification requirement, to which so far as I can tell there are no good objections. Thank you for the quick and thorough reply! I’ll check out those links. It is a worldwide problem. Not only lobbyists in many countries have been fighting introducing AML regulations to lawyers, real estate agents and other businesses that might be involved in the buying and selling of real estate, but also countries themselves worldwide have been very reluctant to introduce any related reforms. There is still no public beneficial ownership registry, for example, in most countries, not to speak of such a registry worldwide. In countries where the real estate agents do have this obligation (EU, for example), implementation falters. Since this is a relatively new obligation, most real estate agents I spoke to in Europe know very little about what they should be doing – and don’t seem to be bothered too much, since the law enforcement doesn’t seem too concerned about this either. In other words – I don’t like to be pessimistic, but I have a feeling that it is not only active lobbying from the above mentioned sectors that is impeding the efforts in this field. I have a bad feeling that politicians in many countries are themselves interested to retain status quo with plenty of grey zones – and there is only one reason I can think of why that is the case. That reason is that they themselves are interested in having channels to keep some shady money behind the carpets (and those are some expensive carpets in expensive penthouses, it seems). I prepare resource materials for Global Investigative Journalism Network. You might be interested in a new resource, just published, on tracking property ownership records. Your readers won’t be surprised that there are many impediments.